In the very beginning of this year, the weed stocks found their bottom and changed their trend direction north! Trade Via Trend was quite ahead of this and posted a nice article about investing in a marijuana sector. In long-term, the cannabis industry is absolutely going up. However, in short-term, we might be ahead of some profit taking, maybe longer consolidation. Below charts depicts a story of well-known marijuana ETF that catches quite well a trading picture of the cannabis industry. A price has almost touched a long-term resistance – see a blue dashed line. 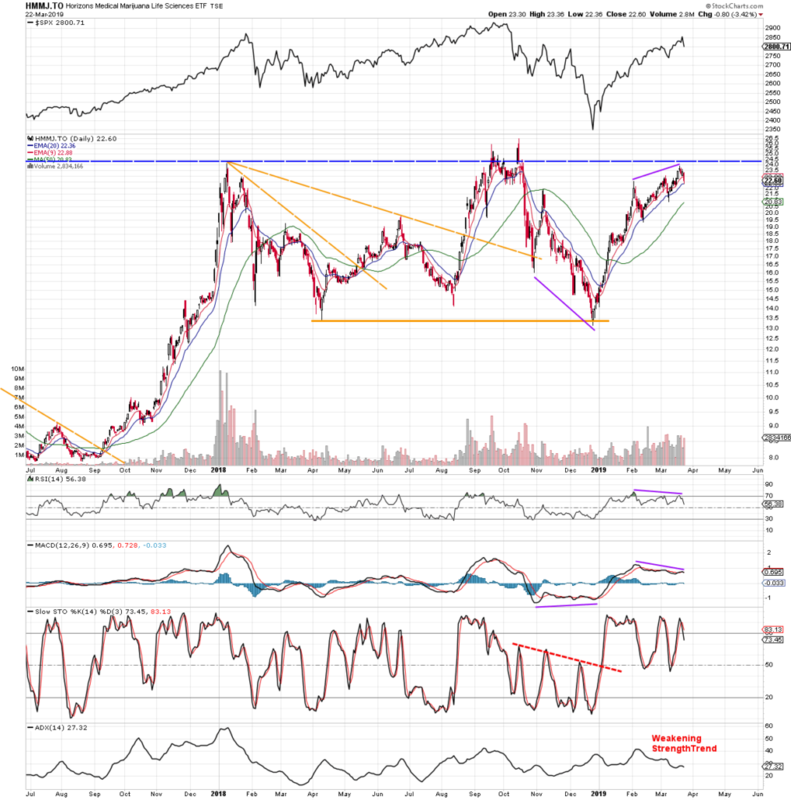 The technical indicators MACD and RSI are showing bearish divergence – see the purple lines. Finally, based on ADX it seems like a general trend is weakening, although still quite strong. A broad stock market is facing challenging times, at the moment S&P is fighting with a strong resistance. The weed stocks started to be more correlative with overall stock market since the last correction and thus, if there is another pullback in S&P, expect the same to happen to pot shares. If you are a long-term investor, it is certainly not a selling time, however, also not a buying time, this is a holding time. If you are a short-term trader, you may consider selling. Below is a trading model that has worked very well since the ETF started to trade. There are many other good marijuana stocks that are not part of HMMJ ETF and may explode in future, however, this is a risky game. The ETF can show you the direction and current status due to its qualitative content of holdings.